Águas de São Pedro (IPA: ˈaɡwas di sɐ̃w̃ ˈpedɾu) is a Brazilian city of the state of São Paulo. 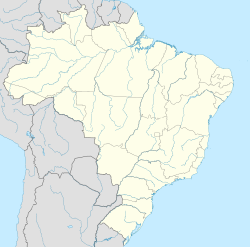 It is the second smallest Brazilian city in area, with only 3.612 km². ↑ "LEI N. 233, DE 24 DE DEZEMBRO DE 1948" [LAW NO. 233, OF 24 DECEMBER 1948] (in Portuguese). Legislative Assembly of the State of São Paulo. Retrieved 10 January 2014. The municipality of Águas de São Pedro is created with seat in the settlement of Termas de São Pedro and with dismembered land from the seat district of the municipality of São Pedro. ↑ "Prefeitura Municipal da Estância Hidromineral de Águas de São Pedro – Autoridades" [Hydromineral Spa of Águas de São Pedro City Hall – Authorities] (in Portuguese). Águas de São Pedro City Hall. Retrieved 10 January 2014. ↑ "17ª Legislatura" [17th Legislature] (in Portuguese). Águas de São Pedro Municipal Council. Retrieved 21 September 2017. ↑ "Official Territorial Area". Brazilian Institute of Geography and Statistics (IBGE). Retrieved 21 September 2017. ↑ 5.0 5.1 "IBGE – Cidades – São Paulo – Águas de São Pedro" [IBGE – Cities – São Paulo – Águas de São Pedro]. Brazilian Institute of Geography and Statistics (IBGE). Retrieved 10 January 2014. ↑ "BR Localidades 2010 v1" [BR Locations 2010 v1] (MDB) (in Portuguese). Brazilian Institute of Geography and Statistics (IBGE). Retrieved 24 August 2016. ↑ "CENSO 2010 – SÃO PAULO" [2010 CENSUS – SÃO PAULO] (PDF) (in Portuguese). Brazilian Institute of Geography and Statistics (IBGE). Retrieved 1 June 2012. ↑ "Águas de São Pedro – SP / Infográficos" [Águas de São Pedro – SP / Information Graphics] (in Portuguese). Brazilian Institute of Geography and Statistics (IBGE). Archived from the original on 22 February 2012. Retrieved 10 January 2014. ↑ "Significado de água-pedrense" [Meaning of água-pedrense] (in Portuguese). Caldas Aulete Online Dictionary. Retrieved 30 December 2014. ↑ "IBGE – Cidades – São Paulo – Águas de São Pedro – Censo Demográfico 2010: Resultados do Universo – Características da População e dos Domicílios" [IBGE – Cities – São Paulo – Águas de São Pedro – 2010 Population Census: Results of the Universe – Characteristics of Population and Households]. Brazilian Institute of Geography and Statistics (IBGE). Retrieved 10 January 2014. ↑ "CÓDIGOS DE SÃO PAULO" [SÃO PAULO CODES] (PDF) (in Portuguese). National Agency of Telecommunications. Retrieved 1 June 2012. ↑ "Ranking IDHM Municípios 2010" [MHDI Ranking Municipalities 2010] (in Portuguese). United Nations Development Programme Brazil. Retrieved 10 January 2014. Wikimedia Commons has media related to Águas de São Pedro. This page was last changed on 1 June 2018, at 01:43.